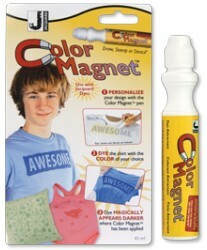 This more liquid formula of Color Magnet, presented in a convenient pen, is perfect for personalizing designs by drawing. Shake well and apply. Leave to dry thoroughly - you can speed up drying by using a hair dryer if you wish. Then dye according to dye package instructions. Color Magnet will attract more dye where it has been applied.